Thinking what to give your photographer friend this holidays? Well, not just photographer friends but anyone you think loves to play around with all those filters. VSCO has been part of daily clicks and uploads as these contains better presets than Instagram, and sometimes it equates to some few bucks to get these presents downloaded. Now here comes this The Chromatic Collection, filters from C4 to C9, a continuum stage of the free C1 to C3 presets. F series presets have these "film feel", the Chromatic Collection has this too - this means that S-curve editing has been observed, contrasts has been increase and the midtones too with details exaggerated on shadows and highlights and faded black and white. These six presets desaturate colors like F series. VSCO mentioned that the collection has strong primary colors mix with muted neutral tones. The skintones make the Chromatic Collection a good choice for portraits. Some of these presets also seem to have special handling of greens, cyans, and sky blues, which could be of interest for landscape images. VSCO's description says that the Chromatic Collection "embodies the bright and bold look of mid-century analog film." Film look, yes. Mid-century, I have no idea. Bright and bold? No way. The Chromatic Collection presets aren't as aggressive about brightening the image as the F series presets are. Or for that matter, the majority of the older VSCO Cam presets. Let's look at the individual presets. C4 is clearly desaturated, especially blues. Overall color balance is a bit warm with bluish shadows. It does brighten the image a bit, but not as much as most of the other VSCO Cam presets do. And with the loss of saturation, the brightness increase tends not to be noticeable. C5 is very warm overall. In general, the blues are cranked way down, leaving an image that tends to be noticeably brown. Sky blues survive and can make an interesting counterpoint. Other colors are noticeably toned down, about the same as the F2 preset. C5 does brighten the image a bit, but not as much as most of the other VSCO Cam presets do. C6 probably comes closest to fulfilling VSCO's claims of "bright and bold" and "strong primary colors mix with muted neutral tones." There is a little brightening, and the colors aren't just toned down a bit, they're often shifted just a bit. For example, lighter skin tones shift toward pink while darker skin tones shift toward red. Greens shift toward yellow, while yellows are more true in C6 than in any of the other Chromatic Collection. Purples tend to darken almost to black. Overall color balance is a bit cool with blue shadows, and although the highlights are mostly neutral, whites have a pinkish tinge — an effect that echoes some of the E series. C7 is a bit less subtle than C8. Caucasian skin tones get slightly more saturated rather than toned down like the other colors, making this a good portrait preset. The darkening (or deepening) of greens is much more noticeable, which may work with some landscape images. Overall color balance is a teensy bit cool, but basically neutral. C8 is the most subtle of the collection. A modest S-curve increases mid-tone contrast, but there is no noticeable brightening of the image. Colors are toned down just a bit, somewhat similar to F2 except that sky blues are preserved better. Greens are somewhat darkened (or deepened, depending on your point of view), making this a good landscape preset. The protection of sky blues and the darkening of greens combine to cause some bright greens to shift toward the blue. The darkening of the greens also causes yellows to be distinctly muted and shifted toward orange. Overall color balance is neutral, with just a trace of cyan in the highlights. C9 is very cool overall. Neutrals get a definite cyan cast, especially in the mid-tones. Non-neutral colors are only toned down a bit, similar to the C7 and C8 presets. Personally, I like C6, C7, and C8 the best. The other three throw a very definite "look" onto the image. At the time of this writing, only a few images have been posted to the VSCO Grid using the Chromatic Collection. Of those, 10 used C7, 8 used C8, 5 used C6, 5 used C9, 1 used C5, and none used C4. I'm a little surprised at the popularity of C9, but the other numbers seem quite reasonable to me. VSCO says, "this collection is being offered at the special price of $2.99." Special? Compared with their other collections, that's a relatively high price for six presets. Still, it's pocket change. 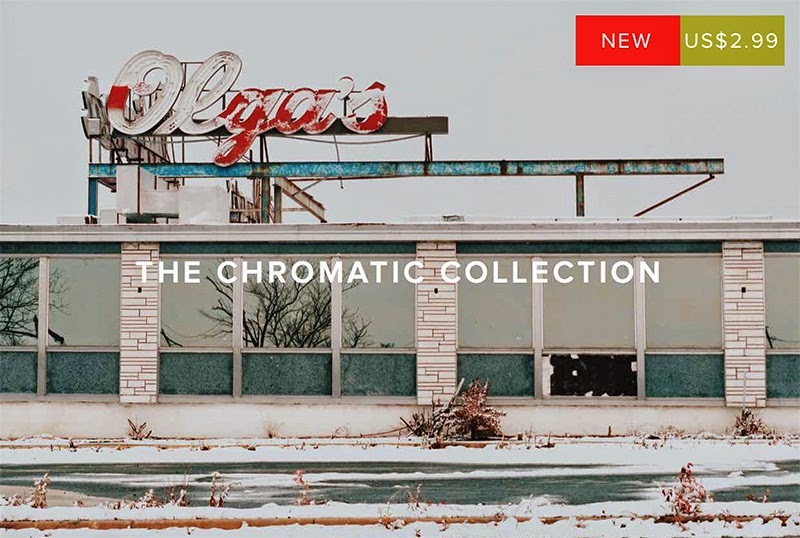 If you like the F series, you'll probably like at least a couple of the Chromatic Collection presets.